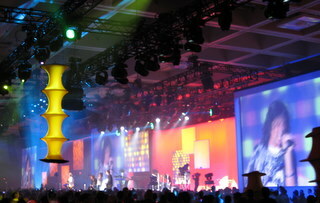 VMworld 2009 was held in San Francisco, California at the Moscone center from August 31 – September 3rd. 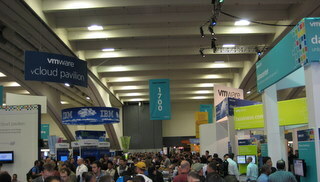 It was a great show and you could really feel the energy from customers, partners, and VMware people alike. Maybe next year I will do some live blogging from the show, but this time I decided to assemble a summary of my week instead. I did fire off an unusually high number of tweets during the week, thanks in no small part to Rich Brambley’s #vmworld3word game. Monday morning I drove up to San Francisco — nice thing about VMworld being local to VMware HQ. Along with others on my team, presented to the Partner Technical Advisory Board (PTAB). Somehow, one of my key slides did not make it into the final consolidated presentation deck there, which was unfortunate — had to wing it. Got to meet Scott Lowe and Rich Brambley face-to-face for the first time. Also met some other partners who liked our presentation content and were interested in follow-up sessions for their teams. During lunch at Chevy’s with some of my teammates, we ran into a former coworker who had joined the dark side. He is a really nice guy and I wish him the best — even if he was wearing a fluorescent yellow shirt all week. This is business, not personal. Monday evening I wandered the solutions exchange during the welcome reception — it was very crowded. Hung around the Community area and met some of the bloggers and customers like Jason Boche, Eric Siebert, Colin Steele, Joep Piscaer, Lars Trøen,and Mark Ylvisaker. Joined the tweetup organized by John Troyer on Monday evening, after the welcome reception closed. Opening keynote from Paul Martiz. Plenty of others have already summarized the keynote; I won’t do it again. I’ll just say that it’s great to have Paul Maritz at the helm of VMware. I thought the hardware integration demos from server partners were excellent. IBM demonstrated detailed monitoring of power consumption — including power per virtual machine. HP’s Insight Control that integrates with vSphere is nothing short of awesome. Spent a lot of time walking the solutions exchange floor. Really enjoyed talking to VMware partners that offer deep integration with vCenter, such as NetIQ and eG Innovations. I also see a lot of promise in the vCloud Express partners — got a nice demo from Terremark which started me thinking… Then, at the Tripwire booth, Steve Beaver and Ted Gary were both there, so I stopped in to say hi. In the afternoon, I rehearsed a few times for the session I had to deliver on Wednesday. I wanted it to go as smoothly as possible for the attendees that would allocate a portion of their valuable time to hear what I have to say. Tuesday evening there was a team dinner with my coworkers at Espetus Churrascaria. In an interesting coincidence, the cabbie that drove me to the restaurant was from Brazil — he said I definitely had to try the chicken hearts. They were not so bad. The keynote from Steve Herrod was cool, with great demos delivered by some of the other VMware guys like Mike Coleman. Delivered my session (VM3085 — Top 10 Reasons Why vCenter is the Best Platform for Virtualization Management) in the afternoon. It went off without a hitch, and I enjoyed fielding questions from customers afterward. Later in the day, HyTrust CEO Eric Chiu gave me a demo of their security appliance. It is an impressive product, and that’s not just my opinion — it won Best of Show this year. The VMworld 2009 party was Wednesday evening and Foreigner put on a great show — despite the criticism leading up to VMworld, it appeared to me that most people were having an excellent time. Ears still ringing from the concert, started off the day with a proper breakfast at Mel’s. Sorry, VMworld planners, those muffin-and-banana breakfasts just do not provide the nourishment a person needs for a grueling day of walking around Moscone. Decided to head over to the Marriott first thing and take a shot at the VMware Certified Professional 4 (VCP4) exam. While I was there I bumped into Duncan Epping — finally got to chat with him face-to-face. He gave me the idea to review the vSphere Configuration Maximums document before taking the exam — that was time well spent. Passed (hello 400) the VCP4 with flying colors. 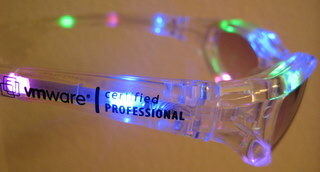 Literally — check out the flashing glasses. Back at Mosone, I stopped by the VMworld Book Store to meet PowerShell guru Hal Rottenberg — he was there signing copies of his book on managing VMware Infrastructure with PowerShell. I was one of the reviewers for that book last year, so it was good to meet him in person. After that I went to a couple of sessions and took one last walk through the Solutions Exchange looking for must-have schwag. I picked up some USB flash drives from HP (hello 2GB), Dell, and eG Innovations — thanks! The highlight of VMworld for me this year was the chance to meet so many people face-to-face for the first time after getting to know them online via blogging and Twitter — the reason I decided to mention so many individuals in this post. In addition, I am impressed by the vibrant community that has grown up around VMware, especially the management products that integrate deeply with vCenter — on both the back end and in the vSphere Client. Enjoy the long weekend, we’ll resume regular VCritical programming soon. Great to finally meet you! I enjoyed your PTAB preso and have always enjoyed your blog! See you in Vegas for the Partner Exchange, hopefully? We shall see how the Vegas schedule works out.